The number of fatalities in North Sinai's Al-Arish car bomb explosion has risen to six as of Wednesday afternoon, Reuters' Aswat Masriya reported. North Sinai General-Prosecutor Emad Dahshan told Aswat Masriya that six people were killed and 10 others were injured. "Three dead bodies of police personnel were found along with the remains of one police personnel, one civilian and the suicide bomber," Dahshan told Aswat Masriya. The Islamist militant group Ansar Beit Al-Maqdis (ABM) claimed responsibility for the explosion in a statement on a Twitter account affiliated to the militant group, declaring one of its members, "Abu-Aisha Al-Masry," as the suicide bomber. According to preliminary reports from Al-Arish, four police personnel were killed, while five conscripts and five civilians were injured in the explosion that took place next to the Police club. 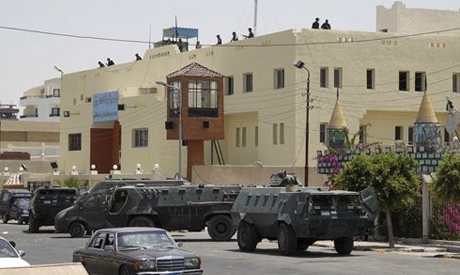 This is considered the biggest attack against security personnel in North Sinai after the announcement on Sunday by President Abdel-Fattah El-Sisi that security forces were achieving huge success in purging the area of terrorist organisations. Last Thursday, six security personnel, also in El-Arish, were injured in an explosion which targeted an armored security vehicle. ABM has claimed responsibility for most of the attacks against Egyptian army and police personnel in North Sinai as well as several terrorist attacks outside Sinai since the ouster of president Mohamed Morsi in 2013, leaving hundreds of soldiers and officers dead. Meanwhile, the Egyptian army has been conducting a wide offensive, dubbed Operation Martyrs' Right, to squash the insurgency. The army declared the first stage of the operation as successful. The Muslim brotherhood terrorists pride and joy. The Muslim brotherhoods North Sinai' terrorist partners are still managing to kill Egyptians. Fortunately, eventually they will collectively be decimated sooner or later. Thanks to the Egyptian Armed Forces. My sympathies to the families of the six men and to the nation. Be strong Egypt. .. IT TAKES TIME TO CLEAN THE GARBAGE...ESPECIALLY WHEN WE'RE DEALING WITH BROTHER-HOOD PSYCHOPATH . EGYPT IS IN GOOD HANDS UNDER PRESIDENT EL-SISI...... IT TAKES TIME.